Dorset is very rich in visible prehistory. In the area visited by the Dorset 100, the main concentration of prehistoric sites is in the area of the South Dorset Ridegeway. This is a chalk ridge, about 25km long by 10 km wide that stretches from Abbotsbury in the West to Poxwell in the East. The international significance of the Ridgeway is based on one of the most diverse Neolithic and Bronze Age landscapes in Europe. The monuments include Neolithic causewayed enclosures, bank barrows, immense henge monuments, stone circles, a dense group of almost 1000 Bronze Age round barrows, and very fine examples of Iron Age hillforts. The survival of so many of the monuments is due in large part to their being on high ground untouched by later agriculture. If you are interested in the archaeology of this area, you need to visit the Dorset County Museum in Dorchester, which is full of background information and where most of the important finds from this region are on display. The Archaeology Gallery has been refurbished and is now open again. The geology of the Ridgeway is also interesting. It is formed by the Weymouth anticline, basically a fold in the earth’s crust that is seen on the surface as a series of ridges corresponding to different strata of rock that have been pushed upwards. The ridges are most clearly visible from the Ridgeway above Portesham part of which is on the final stages of the 100 route. In the Neolithic period, roughly between 4000 and 2000 BC, the Ridgeway was transformed from dense woodland into an open landscape. The most prominent monuments from this period are the bank barrows at each end of the Ridgeway, particularly the one at the Western end on Martin’s Down which is clearly visible form the A35. They were not associated with burials but had some unknown significance, possibly boundary markers. Buried under the Iron Age ramparts of Maiden Castle are traces of a much earlier causewayed enclosure dating from about the early Neolithic Period, and the faint trace of a bank barrow is sometimes visible inside the earthworks. Also dating from this period also are the long barrows, which were burial sites. The best preserved example is the Grey Mare and her Colts which has survived because of the stone use in its construction, but there are several other long barrows around the Ridgeway. The Hellstone was imaginatively but almost certainly incorrectly rebuilt in the nineteenth century. Dating from the same time as Stonehenge in the period 3000 to 2000 BC are Neolithic henge monuments made of wooden posts set into the perimeter of an enclosure. The only one visible from ground level is Maumbury Rings in Dorchester, which was converted into an amphitheatre by the Romans. The Bronze Age is loosely the period between 2000 BC and 800 BC. The main visible monuments from this period are the round barrows that are densely scattered over the Ridgeway and the surrounding area. They were built as funeral mounds and usually contain human remains, and sometimes other grave goods. The most famous artefact to be recovered from a round barrow is the gold lozenge excavated from the Clandon Hill barrow near Martinstown. Also from the early part of this period are the small stone circle at Winterbourne Abbas (the Nine Stones), the larger circle at Kingston Russell (the 100 route passes this circle) and the small circle at Hampton. These circles are almost certainly concentrated in this area because of the source of stone in the Valley of Stones to the west of the Hardy Monument. The Iron Age begins around 800 BC and ends with the Roman Conquest of AD 43-44. The Iron Age people did not bury their dead in the Bronze Age barrows nor did they construct new funeral monuments. The principal monuments of the Iron Age are the hillforts, of which Dorset has some of the finest in the country. 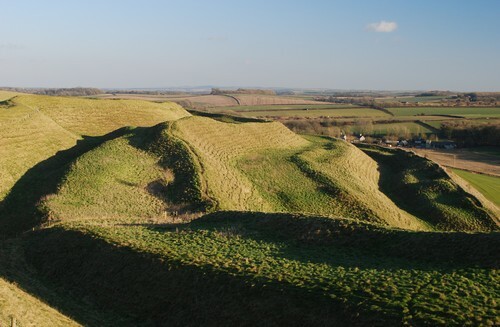 The hillfort at Maiden Castle is among the largest in Europe. It is still awe-inspiring today and must have been a stunning display of power and influence in the Iron Age. It was built on a site that had been occupied since the early Neolithic period, about 4000 BC, and intermittently inhabited afterwards. Other hillforts on or close to the 100 route are Chalbury just past Bincombe, Rawlsbury Camp on Bulbarrow Hill, Nettlecombe Tout between Ansty and Buckland Newton, Eggardon Hill and Chilcombe. Shipton Hill shows signs of Iron Age occupation but was probably not a hillfort. The principal signs of Roman occupation are the town of Dorchester and the Roman roads leading from it. Dorchester is at the junction of four Roman roads. The HQ of the Dorset 100 is more or less on the line of the Roman road from Dorchester to the old port near Radipole, a little north of Weymouth. The route crosses the Roman road going east from Dorchester at Tolpuddle, the road going north at Wardon Hill, and the road going west close to Eggardon Hill. Dorchester is still laid out on a Roman pattern, with the line of the Roman Walls preserved around the town. Every time anyone digs a hole in Dorchester, they uncover the Roman layer, but the only Roman remains above ground are the Roman town house and a short section of the Roman town walls. The line of the aqueduct that brought water to Roman Dorchester may still be seen to the west of the town, south of the River Frome. The 100 walk passes a Roman fort at Waddon Hill about half a mile east of Lewesdon Hill, and there is evidence of a Roman road passing close by. This list covers some of the principal sites close to and inside the 100 route. It is not definitive or exhaustive but includes a range of types of monument. Maiden Castle. By far the most impressive ancient monument in West Dorset. The sheer size and complexity of the construction is mind-boggling. Open access from the Car Park to the north. Eggardon Hill. Another must-see hillfort. Not as impressive as Maiden Castle but with superb views over the Marshwood Vale. On the 100 route. Open access from the east. Pilsdon Pen. A large hillfort most famous for the views from its summit. On the 100 route. Most easily accessible by footpath from the road to the south. Martin’s Down. The best example of a bank barrow, built in a very prominent position south of the A35. Accessible via the bridleway between the A35 and Long Bredy. Kingston Russell stone circle. On a prominent spur between Long Bredy and Portesham, on the 100 route and accessible by multiple paths. About 30 metres in diameter, but not very conspicuous when the grass is long. The Grey Mare and her Colts. A well-preserved example of a chambered long barrow. About half a mile south east of Kingston Russell stone circle. About 100 yards off the 100 route, but not visible from the route. Best seen from the footpath that cuts off west from the 100 route. Poor Lot Barrow Cemetery. Either side of the A35 to the west of Winterbourne Abbas. A range of barrow types including round, disc and bell barrows. There is public access to the barrow group on the south of the A35. Valley of Stones. A mysterious and wonderful place. Along the bottom of the valley is a train of sarsen stones that were almost certainly used for the circles and standing stones nearby. There is an extensive Celtic field system of uncertain but probably pre-Roman date and evidence of pre-Roman dwellings. Open Access land, accessible from the west and south-east. The Hell Stone. Impressive but slightly fraudulent as the chamber was rebuilt in 1866. Accessible by permissive path from the Ridgeway to the south-west of the Hardy Monument. The Nine Stones. A small and mysterious (if you can ignore the traffic thundering past a few yards away) circle with a local folklore tradition. Just about visible from the A35 if you know where to look, but access is by a permissive path from the Little Chef at the western end of Winterbourne Abbas. Bronkham Hill. On the ridge east of the Hardy Monument. A dense concentration of round barrows. You should be able to see over twenty at one time. The sinkholes are a natural phenomenon. On the Ridgeway path east of the Hardy Monument. Maumbury Rings. In Dorchester about 250 yards to the south-west of Dorchester South station. It was built as a henge around 2500 BC but was adapted by the Romans as an amphitheatre and is still used as such today. Broadmayne Bank Barrow. A highly atmospheric place consisting of the Neolithic bank barrow and a concentration of other Bronze Age round barrows including the Culliford Tree bowl barrow. There is a footpath to it from the road to the south. Click to see an interactive map of the sites, but it may not be displayed on a smartphone.